Japanese garden design comes to Duisburg. 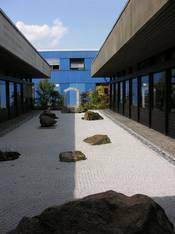 2005 has seen the creation of a Japanese Zen garden at the KROHNE headquarters in Germany. Designed by Kristian Dubbick, the garden covers an area of 200 square metres between two office buildings. Kristian Dubbick is the son of Kristian Rademacher-Dubbick, long-time managing director of the company and now retired. The garden design is based on the much larger Ryoan-ji gardens in Kyoto, Japan constructed in 11th and 12th centuries. "We have changed an unused outdoor area into an oasis of tranquility and meditation for our customers and employees. The garden symbolizes the tension between the innovation time of measurement technology and the contemplative character of a Zen garden", says Kristian Dubbick. Japanese gardens are based on the principle of Kanso or simplicity and an abstract vision of the elements of Nature. Making a Japanese garden is called ishi wo tatsu or setting stones. The garden is a dry landscape with no flowing water or flowering plants to distract the mind from the pursuit of deeper knowledge. The white, raked gravel of a Japanese garden represents the sea. The stones symbolize ships, boats and even islands where moss and lichens represent the coastline. The actual dimensions of a Zen garden are of little importance. The effect of a garden owes more to balanced composition and the meaningful use of relatively small surfaces and spaces. Japanese gardens exude peace and tranquility and their mysterious, enigmatic beauty is a source of constant fascination. We are still not sure today if Zen Buddhist monks consciously followed a deliberate pattern when setting out the stones. Most probably they followed an instinctive approach developed from the experience of meditating a stone composition in a tense state. The refined proportions, the dynamics and the stillness of the stones come together in a composition that draws in the observer's subconscious. Measurement technology and art are closely interwoven at KROHNE. The offices and production buildings are the home also to art works. The Dubbick family, owners of the KROHNE company, are all engaged in the management of a company developing technically advanced products for flow and level measurement. Their interests have always gone beyond business management and include an ongoing, long-standing commitment to the arts. This is true also for Kristian Dubbick, a member of the family's third generation. Kristian is a graduate of the Berlin University of the Arts (UdK) and the Düsseldorf Art Academy and has many exhibitions in Germany and Europe to his credit. His works have also been shown at ART Cologne - the International Fair for Modern and Contemporary Art. Kristian Dubbick's interest in Japanese culture was awakened through business and personal contacts in the land of the rising sun.